Use as a rinse out conditioner, deep conditioner, or for co-washing. Adds a wonderful boost of softness and moisture to dry coils. Distilled Water, Behentrimonium Methosulfate, Cetearyl Alcohol, Cucurbita Pepo (Pumpkin) Seed Oil, Cocos Nucifera (Organic Virgin Coconut Oil), Camellia Oleifera Seed Oil, Cetyl Alcohol, Extracts of Avena Sativa (Oatstraw), Urtica Dioica (Nettle Leaf), Symphytum Officinale (Comfrey) Salvia Officialis (Sage), & Juniperus Communis (Juniper Berry), Panthenol, Hydrolyzed Oat Protein, Phenoxyethanol, Caprylyl Glycol and Fragrance. 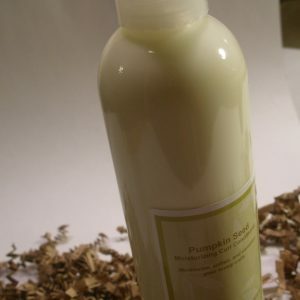 SPECIAL NOTE: Our newer batches of Pumpkin Conditioner will have a slightly green tint to them due to us changing to Pure, organic, unrefined pumpkin seed oil which is VERY DARK GREEN in color:) After mixing, the final color now has a green tint. Same formula, just pure unrefined goodness! It doesn’t get any more moisturizing than pure pumpkin seed oil! Our popular moisturizing conditioner will help to soften, moisturize and condition your beautiful coils. We scent this with a sweet, delectable pumpkin pie scent.